I’ve recently took a hiatus from blogging -guilty pleasure-, I had to get back on track on editing & deliveries from the wedding season. August was such a beautiful month -photography speaking-, and I’m just so pleased to show you Nick & Huong engagement session. They came from the States for a short vacation trip, to celebrate their recent engagement and upcoming wedding. We met at Luis Muñoz Rivera Park, which is the biggest park in the Old San Juan area. 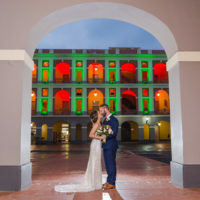 It is located right at the entrance of the Old City, but more importantly, steps from El Escambrón beach, which is the only accesible beach at the Old San Juan isle. It is VERY crowded on weekends, that’s why I’d rather schedule sessions on weekday afternoons: no one will take us the sunset view away! What can I say about N & H?! They are quite funny, sweet, cute, and madly in love. I just couldn’t stop smiling the whole session, my camera was just dripping honey from such cute personalities. We spent a really cool, fun and calm sunset together, and I’m really grateful I was chosen to keep these beautiful memories. Hope you’ve enjoyed this set as much as I did shooting it! For an eternal sweet, puppy love… cheers!